In applications where traditional size warp beams are quickly woven out, bobbin creels could be an alternative option. Bobbin creels are used for many different technological applications, e.g. warping, weaving, warp-knitting and pultrusion procedures. The bobbin creel must be able to accommodate an adequate number of bobbins and ensure that the yarn tension is equal across the entire warp sheet. The size of the bobbin creel and the number of package positions will depend on the number of yarns required. Weaving from additional or larger beams on separate let-off frames is an ideal solution if the space requirement for the bobbin creel is too big. 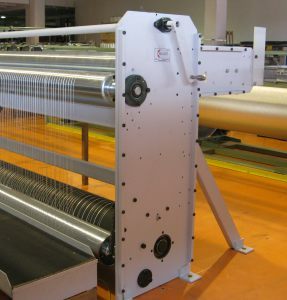 The warp feed device works as a warp tension controller between the bobbin creel and the weaving machine and feeds the yarn at the adjusted tension to the weaving position. The thread draw-off from the bobbin creel normally takes place on a lower tension than used for weaving. There is no doubt about the fact that it is important to work with a sophisticated bobbin creel that keeps the tension constant over the warp sheet. If the run-off from the creel is not perfect, even the best warp feeding device cannot compensate tension variations across the warp width. The feed unit is used to draw-off the threads from the creel and feed the warp to the weaving machine at the correct tension. Depending on the application various motors are available to drive the delivery roller. The warp thread tension can be measured with a load cell either direct at the warp or at the back rest roller. With this measurement the controller computes the correct motor speed. The warp tension can be set by springs either at the backrest roller of the warp delivery unit or the weaving machine. Our warp yarn feeding devices are standing for a constant and fault-free production. The devices can also be used for multilayer woven technical fabrics, with a substantial fabric thickness, many times greater than the diameters of the yarns used. For the different routes of the warp yarn between layers and weft yarns, different feeding rollers are required. We design and manufacture feeding devices tailored specifically to your requirements.